Aukey's first home security camera promises panoramic views and motion-triggered alerts, but suffers from hit-or-miss accuracy. Aukey is a company more known for mobile accessories like car chargers and Bluetooth speakers than smart-home products. So it was a bit surprising when it announced its first home security camera would be an ambitious, full-HD, panoramic model. But while its features are impressive on paper, its rookie status was all to apparent when we put it to the test. The Aukey Wireless Indoor Surveillance camera (model VT-CM1, $110) cuts an attractive hourglass figure with a shiny black finish. The head unit houses a 2MP 1080p camera with a 92-degree field of view. That’s not as wide as most cameras, which typically run in the 110- to 180-degree range, but that head unit rotates 360 degrees, allowing you to take in an entire room. Using the camera’s companion mobile app, you can pan, tilt, and zoom to ensure you don’t miss a thing. The camera’s wide base lets you set it securely on any flat surface, but you can also mount it to a wall or ceiling with the accompanying bracket and screws. The camera uses infrared LED night vision to illuminate low-light environments up to 49 feet. It also has a built-in microphone and speaker; this allows you to listen in on what’s happening at home and, if necessary, pacify an anxious pet with your voice or check in with children or elderly parents. The head of the Aukey VT-CM1 rotates 360 degrees to give you a view of the whole room. It supports motion detection, pushing real-time notifications to your mobile device when it catches movement. It does not, however, use audio detection. That’s a drawback because sound can tip you off to activity that’s happening off-camera. That’s particularly important with a camera that has as narrow a field-of-view as this one. Unlike many home security cameras, the VT-CM1 doesn’t come with a cloud account for storing your surveillance videos. Rather, they are saved locally to microSD card (up to 64GB, not included). The upside to this is there are no ongoing cloud-subscription costs, which can tally anywhere from $50 to more than $100 per year depending on how many days worth of stored recordings a given service offers. Storing the video locally on the camera, on the other hand, also means you risk losing the forensic evidence of a crime if the intruder steals or destroys the camera. Though virtually all home security cameras promise easy setup, some are more cumbersome than others. But the VT-CM1 really does take just moments to get up and running. You just plug it into your router with the supplied ethernet cable, download the MIPC app to your smartphone and follow the on-screen prompts to add the camera and connect it to your Wi-Fi network. The whole operation took me about five minutes. When motion is detected, the camera can take snapshots and record video and save them to microSD card. Once the camera is connected, you’ll see the live feed in the MIPC app. A menu of tools runs across the top with controls for toggling the speaker and microphone on and off, taking a screenshot of the feed, and accessing image settings. Along the bottom are icons for switching between the live feed, your library of video records, and the camera’s settings for alerts, scheduling, and more. The VT-CM1’s video quality is very good, with rich colors and none of the image bending around the edges you see with wider-angle lenses. Night vision is also crisp for the most part, though the image did tend to lose details in dark corners of the room I monitored even though they were well within the 49-foot range. The camera’s real selling point is its pan-and-tilt feature, which allows you manipulate the camera to get a view of the whole room or conceivably track a pet, family member, or even an intruder as they move through the room. You control the camera’s movements by swiping your finger up, down, left, or right across the live-feed image. Short swipes produce incremental movements while long swipes trigger more sweeping ones. You can zoom in by spreading your fingers across the image to enlarge it. This is a common way to control pan-and-tilt cameras, but the execution in the MIPC app was a little temperamental. There’s a several second gap between a swipe and actual camera movement, so I’d often swipe multiple times thinking the camera wasn’t responding. Naturally, this would make the camera pan or tilt farther than I wanted. There’s also no real way to determine how long of a long swipe is too long; sometimes one would rotate the camera about 90 degrees, but other times the same swipe would send a good 180 before it would stop and swing back to its original position. Then there were times when the camera wouldn’t respond to any swipe at all. The Aukey VT-CM1 offers plenty of ways to customize the camera’s motion detection. The VT-CM1 can record video 24/7. While that’s useful in a business setting or if you’re monitoring a vacation home, in your primary dwelling you’re more likely to only want to record when the camera detects motion. The MIPC app offers plenty of customization options for this feature so you’re not bombarded with false alerts. 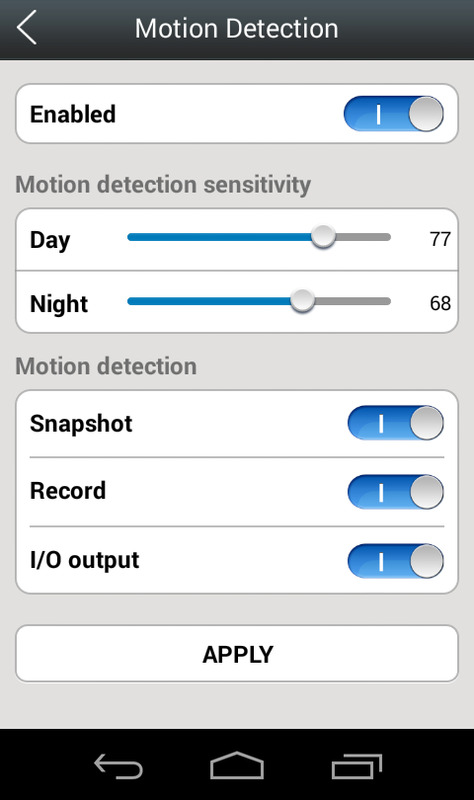 The detection sensitivity for day and night modes can be calibrated separately.. You can also create up to four schedules for when motion detection and video recording should be active—from when everyone leaves the house in the morning until the kids get home from school, for example. Despite the experimenting with these features, however, I couldn’t get the camera to detect motion with any consistency. A person at the far end of the room moving a limb would trigger an alert, but waving my hand directly in front of the lens would produce nothing. Further, when you do get an alert, tapping it should open the app so you can go to the live feed and see what’s going on in your home, but several times when I did this the app didn’t even show my connected camera, just a blank screen. That’s pretty disconcerting when the security of your home could be at stake. The VT-CM1 has all the makings of a great home security or nanny cam: an attractive design, pan-and-tilt functionality, highly customizable features. Unfortunately, the execution fell short in our tests. Until these bugs are worked out, we can’t recommend it, especially with so many other good home security cameras available.